When it comes to PPC ads, most marketers don’t go beyond investing in Google AdWords. And in some cases, this decision is completely justified. After all, Google dominates PPC ads with a worldwide market share of 86.87% (as of October 2017). And with memes like the one below running rampant on the internet, it’s easy to see why someone would think twice before advertising on Bing. Here’s the truth! Investing in Bing ads doesn’t mean you need to stop investing in AdWords. 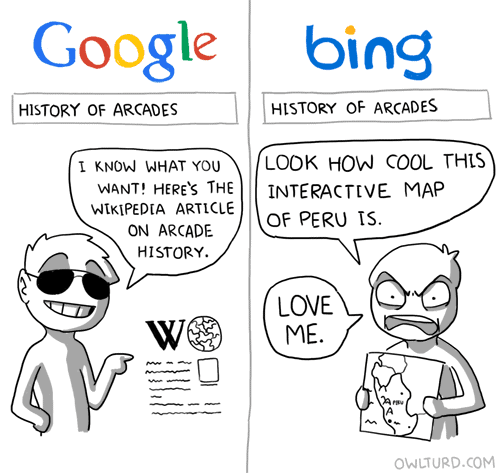 Bing will probably never catch up to Google’s dominance in search engines. This is not a typical “Google AdWords vs Bing Ads” article. Having said that, there are certain features on Bing that are either missing in AdWords or just simply better. We’ll be highlighting these features and more in this article and help you understand some of the unique benefits of advertising in this platform. So here are 6 reasons why you should start investing in Bing ads. The average CPC rates on Google are incredibly steep due to high competition. For small business owners who are doing PPC for the first time, this can perhaps be the biggest hurdle. On the other hand, Bing has less competition, and CPC rates are cheaper and you’re guaranteed better ad positions. According to WordStream, the average CPC is 33.5% cheaper on Bing when compared to Google. Furthermore, Bing ads are often in better positions than their Google counterparts, resulting in higher click-through rates (CTRs) and conversions. This makes Bing ads a far more viable option for small to mid-sized businesses. So if you’re running on a shoestring PPC budget, Bing is a much more cost effective solution. Bing allows its users to adjust their bids for various device types, including mobile devices and tablets. In other words, you can increase or decrease your bid for traffic coming from desktops, tablets, and smartphones. Furthermore, you can opt out of desktop and tablet searches, and target only mobile searches. With Google AdWords, users can’t opt out of desktop searches. You can of course target searches from mobiles and tablets, but you’d have to do so in conjunction with desktop searches. This is one of the biggest advantages for AdWords loyalists who are willing to advertise on Bing. Bing allows you to directly import your AdWords onto its platform. This means you don’t have to waste time creating new campaigns on Bing. Bids and budgets: Bing Ads has different minimum bid and budget requirements than Google AdWords. By default, Bing raises any bids and budgets that are too low its minimum requirements. During import setup, you can opt out of these increases, but Bing Ads won’t import campaigns that are below the default minimums. Targeting options: Targeting options such as location targeting and time of day targeting are significantly different in each platform. You definitely need to review these options on Bing before launching your campaign. Negative keywords: Bing Ads does not use broad match negative keywords. If you have set up broad match negative keywords in Google AdWords, those will be treated as phrase match negative keywords when importing to Bing Ads. With Bing Ads, you have the ability to control which gender and age demographics see your ads. This sort of targeting is especially useful for marketers who have their buyer personas in a particular gender or age group. Google, on the other hand, lets you do demographic targeting only on the Google Display Network, and not on the search network. According to Search Engine Journal, Bing powers nearly one out of every three searches in the U.S. with a market share of 22.8 percent. That’s a huge number of potential customers being ignored by opting out of Bing ads. Furthermore, comScore data shows Bing’s market share is growing faster than Google’s, owing to the growth of Windows 10, since Bing is integrated throughout the entire desktop operating system. So if you’re catering to the U.S. market, Bing is an advertising platform you can no longer ignore. Social extensions are ad extensions placed under your ad copy that direct potential customers to your social accounts. These extensions allow businesses to engage with potential customers more directly and allows users to join conversations with brands on social media. With Bing, you can add extensions to your Facebook, Twitter, and Instagram business pages. On the other hand, with Google AdWords, you can just add a link to your Google+ page. Google+ has its advantages, but quite frankly, businesses are a lot more active on Facebook and Twitter. Bing has less competition and advertisers can enjoy unique features that AdWords doesn’t offer yet. While it’s highly unlikely they’ll ever reach AdWords’ dominance in the PPC market, it’s time marketers see Bing ads as a formidable advertising platform. As highlighted in this article, investing in Bing ads can help you reduce costs and drive high-quality traffic back to your site. What do you think of advertising on Bing? What has been your experience with the platform? Please share your views in the comments section below.